I promise I’ll be back into living-mode versus work-mode starting tomorrow. It’s been a helluva two weeks and I’m exhausted. There are a couple bright spots to speak of during this dark time. One of which, fitting for me, is a book. If you’ve read my previous book reviews (you can easily do so by typing in ‘book review’ in the search bar), you can see that I’ve had a pretty good record, reading some phenomenal books. I want to point out that the primary reason for this is because of book stores. When I enter a book store, whether it’s Green Apple or Books Inc., I’m immediately drawn to the staff recommendations and their index-card reviews. Amazon tells me nothing. The interweb recommends crap. If you want to spend your limited hours on earth reading worthwhile literature, then get yourself to a book store and pick out a couple of books that the staff took the time to read and cannot stop raving about. That is the reason for my winning record. Go support your local bookstore! Moving on. Forget Cutting for Stone, Cloud Atlas, A Visit from the Goon Squad. Those are all top-notch, but this little book surpasses them all. 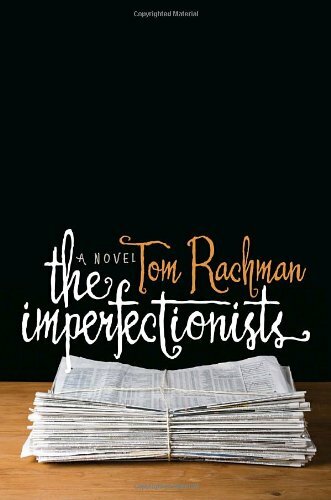 The Imperfectionists by Tom Rachman. Every character is tragically flawed, but also deeply human. There’s the powerful, pretty, and ambitious editor-in-chief dedicated to running the newspaper; the aging, down-on-his-luck lothario trying to build a relationship with his grown children; and the ostracized copy editor who simultaneously loves and hates her job. These are just a few of the characters who you want to slap some sense into, comfort and hug, and grieve with. You can relate to this right? We’ve all been lonesome and depressed at some point. The entire book is a narrative interrupted by winces and sighs. Beautifully-written. Rachman squeezes lifetimes of anxiety, regret, and perseverance into 250 pages. Get this book now.